W. David Keith has never met a Taco he didn’t like. He believes his hometown of Kansas City is one of the most under rated, underappreciated Taco Towns in the USA. TACO THE TOWN is a safe place where taco lovers can talk about loving tacos. A judgment free zone. 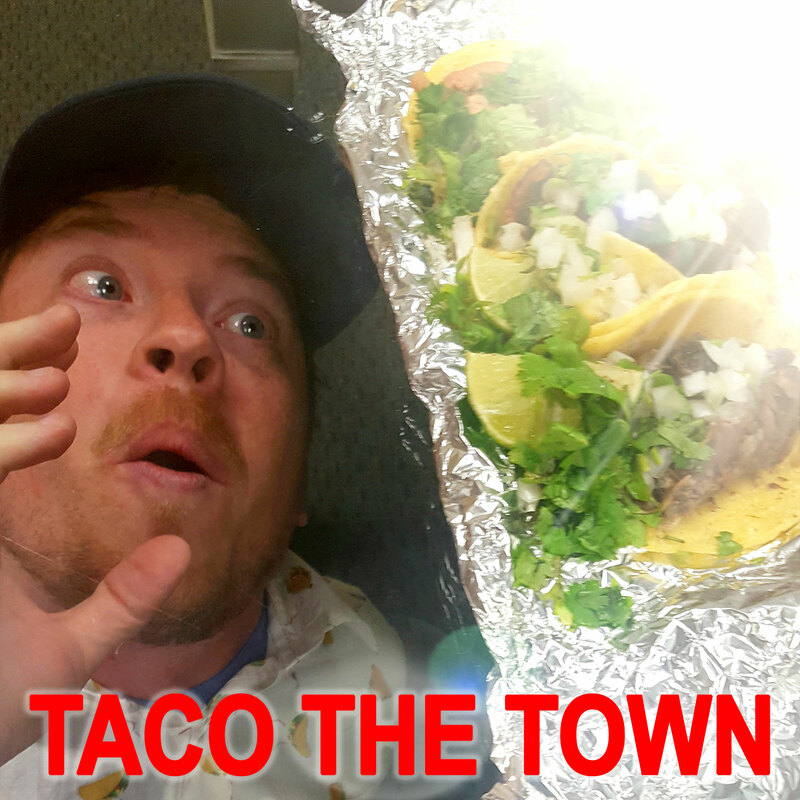 On every episode of TACO THE TOWN Dave will be joined by a guest who will share with him their favorite local taco eatery. They’ll share some stories, share some laughs and most importantly…share some tacos! Welcome to TACO THE TOWN! This week we're ON THE ROAD! Eating Tacos in NASHVILLE, TENNESSEE! Joined by special co-host Michael McMillian (Crazy Ex-Girlfriend, True Blood), we hit up one of Nashville's Top taco spots, MAS TACOS POR FAVOR with local Nashville taco and biscuit fanatics JORDAN HALE and DANIEL HIGBEE or JORDANIEL (if you prefer) and we have the TACO TIME OF OUR LIVES! This week we're back in wonderful and wacky Waldo trying out the tasty tacos at CHELLY'S CAFE with guests STACY NEFF (One More Cup) and BENJI KING (Politics/Taco Fanatic)! Stacy tells us about working and living in Waldo and also fills us in on why Chelly's is one of her favorite taco spots in town! Benji walks down memory lane and tells us about his many former awful jobs (Burger King, Taco John's, Minsky's)! ALSO IN THIS EPISODE: Door-to-Door Taco Salesmen? Amigo's! And Dave proclaims that Chelly's might just have the best Carnitas Taco in Town! TACO THE TOWN! The best podcast to listen to while driving around KC dodging Potholes!" T3 explores the Historic Northeast Neighborhood of KC and discovers some tasty tacos at TACOS EL GUERO with guest taco reviewers JULIA GUERRA (Architecture/Construction/Taco Specialist) and TERESA MALY (Wellness Blogger/Planet Comicon Social Media Maven)! Dave and the gang also chat about STREET SALSA! The KC Museum! SUPER FLEA! Voted #1 Flea Market in KC! MINI HORSES! And Teresa tells us about her favorite taco place in St. Joe! In the TACO TICKER, we celebrate Taco Bell's 57th birthday and taco 'bout the Tripleupa and Steak Rattlesnake Fries! We also talk Postmates Taco Delivery and The new Minsky's/Joe's KC BBQ Pizza Mashup and what other KC Restaurant's we'd like to see do a mashup! ALSO IN THIS EPISODE: TACO VANS! KNOBTOWN PARKING LOT TAMALES! TACO VISITOR CENTER ARCHITECTURAL DESIGNS! Favorite KC News Personality! Favorite KC Guilty Pleasure! And Julia gives us the Behind-The-Scenes of Rowing down the Missouri River! LOOK FOR THAT GLOWING TACO SIGNAL IN THE SKY!! ONLY TACOS CAN SAVE US NOW!! It's the Greatest Week of The Year! The Pitch's KC TACO WEEK! In honor of this Taco Celebration, we organized a Taco Pub Crawl down Wornall Road and taste test the tasty tacos at LEW'S, THE WELL and CHARLIE HOOPER'S with our special guest reviewers from The Pitch KELCIE McKENNEY, REBEKAH LODOS, and JAKE EDMISTEN! Dave and the gang issue a Taco Challenge to all T3 listeners and give tips & tricks to organizing your own Taco Week Taco Crawl! Taco Topics Discussed: MUSTARD ON TACOS?! EATING TACOS IN KILTS! TACO THEMED HAIRCUTS! Is Taco Tuesday a Good Night to pick up Singles at Charlie Hooper's? In the TACO TICKER: The Man who dipped his testicles in Salsa! A Ski Resort in Ontario that has Slide Thru Take Out Windows at Taco Bell! ALSO: We talk to Steve Brown, Kitchen manager at Lew's and George Stark from Charlie Hooper's! And we try Lew's famous DAS BOOT Full of Beer! Grab your friends and organize your own Taco Crawl and maybe mix in some pelvic thrusting on the stage at The Well! It's TACO WEEK 2019! MARCH 18th-24th! The Most Taco-full time of the Year! Check out thepitchkc.com/tacoweek for all participating restaurants!" T3 is in the BKS (That's Brookside y'all!) and we're reviewing the tasty tacos at BROOKSIDE BARRIO with guests Wellness Guru SARAH BUCHANAN (Indulge, @we.indulge) & Lawyer turned Influencer/Taco Lover BREA VOKOLEK (@overanalyzedthat)! We talk about Tacos and why they bring such happiness into the world and inspire us all to be the best taco supporters we can be! We also cover many taco topics such as: Peanut Butter Tacos! Fruit on Tacos! Raising your children to love Tacos! Yoga Taco Poses! And what whiskey is best to have with your Tacos! The gang also breaks down their favorite spots in Brookside as well as their favorite brunch spots in KC! In the TACO TICKER, we discuss the Man trapped in the snow for 5 Days who lived off of Taco Bell Sauce packets! We also talk about a Modelo Beer Highway truck crash and the Taco Bell employee who puts inspirational messages in people's takeout bags! ALSO: In TOWN OF THE TACO we taco 'bout the Best Places in KC to take Out-of-Town Guests and What's the Best Thing Happening In KC Right Now! ALSO: Is KC One of the fattest Cities in the US? And TACO NIGHTMARES! Put on your favorite Pitbull Greatest Hits CD and head on over to Brookside & crush some Tacos with the T3 Crew!" Kansas City has become FLAVORTOWN with the opening of the newest taco joint GUY FIERI'S DIVE & TACO JOINT! Dave is joined by guests SAM BILLEN (Primary Color Music) and IVANI BING (Magic 107 FM) and they review the Tacos and Trashcan Nachos from KC's newest hot spot in the Power & Light District! The gang also covers Meat Sweats at Brazilian Restaurants and the best Dives and Joints in KC! Sam tells us about Mexican Food in Japan and his dream of opening up a Mexican place there as well as the time he won a years supply of free Pizza! Ivani reveals her disdain for waffles, Oak Park Mall and her love of the Golden Corral! Dave tries to come up with new Guy Fieri inspired catch phrases for the show! In the TACO TICKER we cover Drive Thru Chipotlanes, GrubHub Taco Bell Delivery and the Case of the Crab Leg Buffet Brawl! In TOWN OF THE TACO we taco 'bout How We Describe KC to people who have never been here as well as What's a Place in KC whose Time has come and Gone! The music is loud, the tacos are tasty and the tips are frosted in this week's T3! T3 hits the great taco town of Lawrence, KS once again and reviews the tasty tacos at LUCIA BEER GARDEN + GRILL w/ special guests writer/podcaster NICK SPACEK (From & Inspired By Podcast, Starburst Magazine, Lawrence Magazine) and musician/podcaster KATLYN CONROY (La Guerre, Cowboy Indian Bear, Hospital Ships & Creep Quest Podcast)! Nick and Katlyn update us on the latest changes in the Lawrence Taco Scene and tell us about their favorite film soundtracks! Katlyn runs down a list of her recent favorite stories in creepy weird crypto news! We get into a deep conversation about the man who killed a mountain lion with his bare hands (were tacos involved?) and Katlyn informs us on the Ins-and-Outs and tricks of the 'ON THE BORDER' Bottomless Taco Challenge! In the TACO TICKER: A woman gives Birth in a Taco Bell Parking Lot! What should she name the baby?! And The Home of Taco Bell founder Glen Bell is on the market again! The Home That Tacos Built! It has a SPORTS COURT! In TOWN OF THE TACO we taco 'bout UNION STATION and LAZER LIGHT SHOWS! And Colleges around KC! Dave remembers the time a Michael Jackson Impersonator visited his Elementary School! ALSO IN THIS EPISODE: A Burrito Eating Squirrel! And Weird T-Shirt Requests! Coming to you straight outta Lawrence 'Friendly' Kansas!! Be sure to check out Dave's appearance on Nick's podcast FROM & INSPIRED BY where they talk about the soundtrack to Boogie Nights!! Travel Expert and Continent Hopper BROOKE ROBERTS (@thenewdorothy, Brazenist) joins us on T3 this week as we taste test the tasty tacos at TRIBE STREET KITCHEN in the River Market! Brooke shares with us some of her best travel stories (THE TOP 4 PLACES TO VISIT BEFORE YOU DIE!) and globe trotting travel tips as well as tales about growing up in Southeastern Kansas and saving up her money for some Taco Tico! There's a lotta TACO TICO talk in this episode as well as Overseas Taco Talk! IN THIS EPISODE: Dave tries to convince Brooke to travel to the exotic locale of Belton, Missouri! Dave and Brooke talk about their Grandpa's Tattoos! Dave reveals a bad taco date he once had! In the TACO TICKER: We talk Taco Bell's Galentine's Day Party Tips, Taco Bell opening up in Thailand and we even touch upon the new Guy Fieri Taco Joint opening up in the P&L! This one has it all: STREET MEATS! INDIAN FOOD! DRACULA'S CASTLE! BEST OVERSEAS EATS! EATING IN THE WORLD'S FANCIEST McDONALD'S! Brooke's Favorite Overseas Customs! In TOWN OF THE TACO we discuss KC's Most Underrated or Hidden Attraction! As well as How do you describe KC to someone who has never been here? ALSO: We talk a lotta tongue (lengua, that is) and Brooke tells us about the time she visited DAVE'S COZY LITTLE HOSTEL!! Climb aboard this taco caravan! Wondrous taco adventures await!" It's our VALENTINE'S DAY Episode and no dadgum Ice Storm is gonna keep us from eating tacos this week! TACO THE TOWN is back and this week we review the tasty tacos from EL PATRON with guest reviewers Emily Keizer and Boyce Richardson (CoastlessKC Podcast). Emily gives us her breakdown of the top Chips n' Salsa in KC as well as her go to tacos at Torchy's when sh goes to Texas and Boyce reminisces about his days working at a Mexican Restaurant in the Pittsburg, Kansas Mall and remembers his Southeast Kansas Taco Roots. We run down a list of the Worst Valentine's Day Gifts and remember Good and Bad Valentine's Days from our past! We even break down the proper way to order food at Carnicaria San Antonio and Joe's KC ("RESPECT THE SYSTEM!") In the Taco Ticker we talk about Costco's Street Taco Kit! A 12 Pound $65 Super Bowl Taco! Wouldya Eat It? T-Mobile Offering Free Taco Bell Tacos!! In TOWN OF THE TACO We Talk about our Favorite Childhood Memories of KC! And Our Favorite KC Guilty Pleasure! ALSO IN THIS EPISODE: We talk about overseas tacos and TACO BELL arriving in London and Dave is asked "What fictional world do you think has the best tacos?" Don't let the Cilantro Soap Truthers get you down! Taco The Town is here to set things right! T3 reviews one of Dave's favorite little taco stops, CARMEN'S COCINA II in Olathe this week with guest taco reviewers Actor/Model/Wrestling Announcer CHRIS LEON and Actress/Model/Info-mercial Producer JESSI BURKETTE! We discuss wacky and inventive SUPER BOWL Eats and what exactly are Trash Can Nachos? The gang runs down many taco topics such as: PEAS IN TACO? POTACOS: YAY OR NAY? and Taco Bell Flavored Oreos: Would ya eat 'em? Jessi tells us about the time she won a Oreo Stacking Competition as an 8 Year Old & Chris faces Dave's wrath for ordering a Burrito! In the TACO TICKER we talk about a Toronto Taco Bell that created a Nacho Cheese Dispensing Billboard as well as discuss the El Chapo Trial where it was revealed the Mexican Drug Lord was discovered by the authorities by sending his men out for some tacos to go! In TOWN OF THE TACO we talk about our Favorite Neighborhoods in KC and we tackle KC Dance Clubs and a little place called FUNKYTOWN! ALSO: Jessi tells about the time she was inflicted with the affliction known as Jalapeno Hands and we get into her Cilantro Addiction (Would she wear Cilantro-infused clothing?) And In a very lively TACO TO ME, Dave is asked the question all of America has been wanting to know...does he own Taco-themed Underwear?! This episode has it all...except for Potacos! Copyright 2017 Lotuspool Records LLP. All rights reserved.